This work was painted during a trip to Echuca with Arthur Boyd, at the junction of the Goulburn and Murray Rivers (Barmah Forest). Deutscher and Hackett gratefully acknowledge the assistance of Lyn Williams in cataloguing this work. Motivated by the characteristic desire of young antipodean artists to see the great art of Europe, Fred Williams spent five years between 1952–56 in London, learning from the masters, practicing his craft and maturing. Returning to Australia on a ship scheduled to take visitors to the 1956 Melbourne Olympic Games back to England, Williams first docked at Fremantle where he saw the landscape of his own country through new eyes. Struck by the vast featureless spaces and harsh light of his homeland, and the distinct contrast this presented to the picturesque English countryside with which he had become familiar, Williams recognised the potential and resolved to make the landscape the primary subject of his art. This decision was momentous for Williams and for the history of Australian art. In addition to bringing forth a unique vision which would influence the way Australians saw and imagined their own country, it provided Williams with a subject that would sustain his interest and artistic development throughout his career. Williams took advantage of all opportunities to paint and the landscapes of the late 1950s depict places he holidayed, including Mittagong in New South Wales, as well as areas that were closer to home and the destination of outdoor painting excursions such as Sherbrooke Forest in the Dandenong Ranges on the outskirts of Melbourne and the coastal town of Lorne. 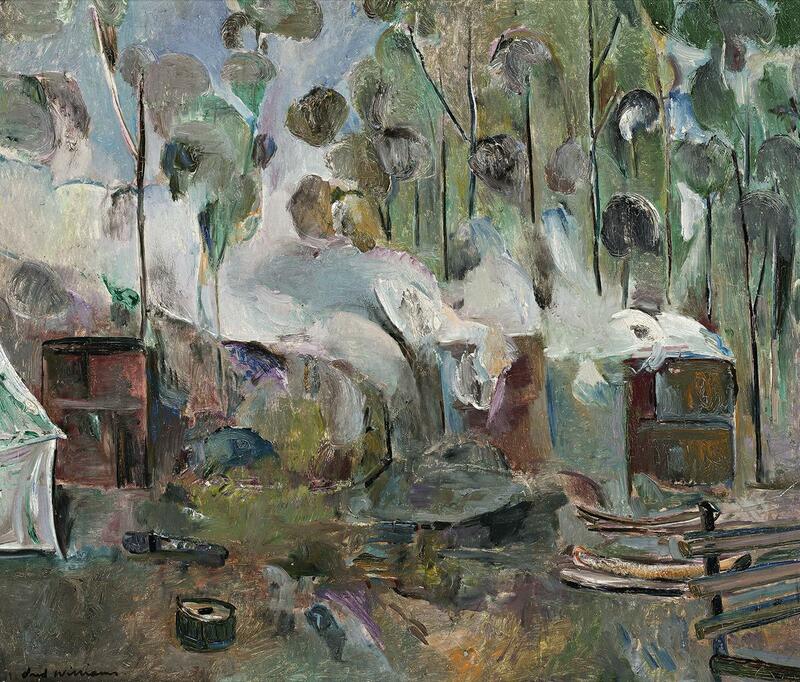 In 1959 Williams and his artist friend, Arthur Boyd, went to Echuca, visiting the Barmah Forest at the junction of the Goulburn and Murray Rivers, and Landscape (The Charcoal Burner), 1959 was painted during that trip. Depicting a group of braziers fashioned from oil drums in a small clearing in the bush, thick white smoke filling the canopy of the tall background trees, the painting uses lyrical and unexpected colour, incorporating painterly strokes of purple and orange paint with the deep greens and blue tones of the bush.